Parallelogram, Exterior Point, Triangle, Area. Conformal Mapping or Transformation of Geometry Problem 1381. Poster of Geometry Problem 1381. Circle, Diameter, Radius, Perpendicular, Congruence. Conformal Mapping or Transformation of Problem 1382. Triangle, Median, Circle, Chord, Secant, Sum, Product. Triangle, Orthocenter, Circle, Circumcircle, Angle Bisector, 90 Degree. Triangle, Orthocenter, Circle, Circumcircle, Angle Bisector, Midpoint, Collinear Points. Conformal Mapping or Transformation of Problem 1386. Quadrilateral, Double Angle, Congruence, Isosceles Triangle. Triangle 40-60-80 degree, Incenter, Congruence. Triangle, 40-120-20 degree, Angle, Congruence. 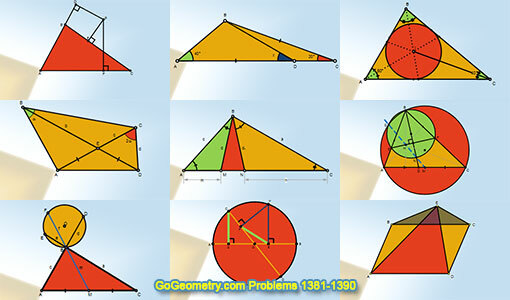 Poster of Geometry Problem 1389. Triangle, any point, perpendicular, sum of the squares.